Launching in August, famed imprint and all around dance music brand Defected brings its selection of house masters to the shores of the Adriatic over 5 days. 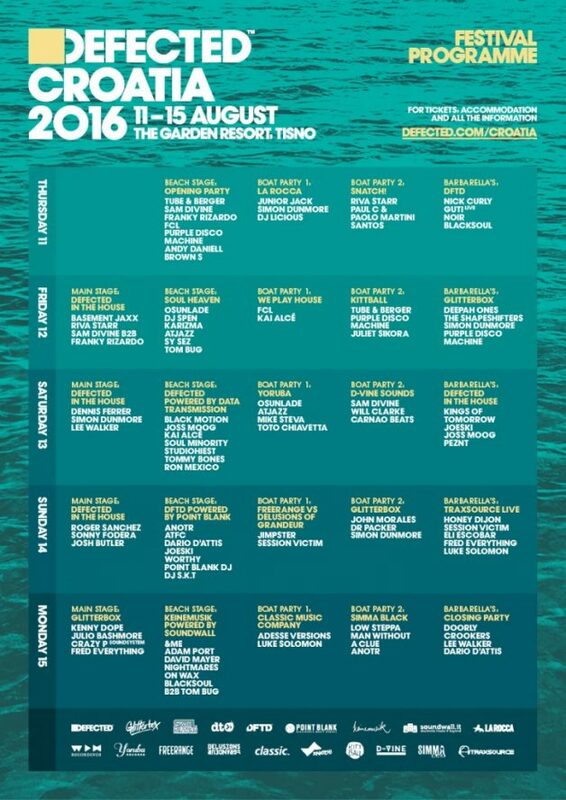 Defected Croatia is a festival taking place at the idyllic Garden Resort in Trisno, Croatia. A combined selection of beach and boat parties, as well as a main stage will create a unique clubbing experience, while the likes of Basement Jaxx (DJ Set), Dennis Ferrer, Julio Bashmore, Kenny Dope, Roger Sanchez, Guti (Live), Nick Curly, Osunlade, Noir, Riva Starr, and way more bring the tunes. Amongst the artists, Defected In The House, Strictly Rhythm, Glitterbox, Classic and DFTD will each host respective stages and events throughout, featuring even more of the finest superstar house artists, underground DJ talent and the highest standards of production.